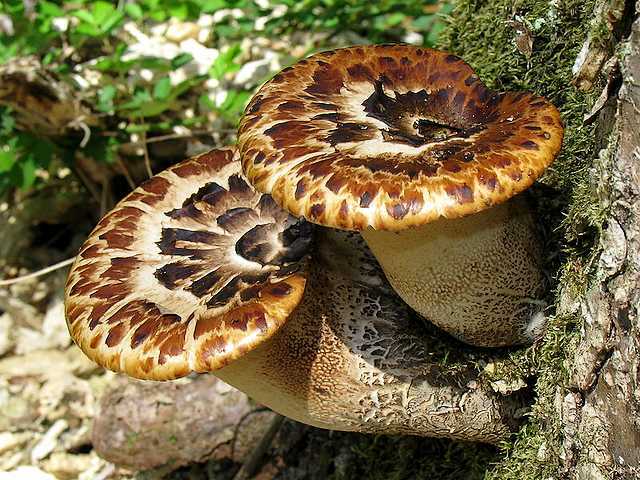 Mushrooms Polyporus squamosus (dryad saddle, pheasant back or hawk wing) are widespread in North America (east of the Rocky Mountains), Australia, Asia and Europe. They are living on dead logs or stumps, where cause white rot in the heart of the hardwood and play an important role in woodland ecosystems. The Polyporus squamosus mushrooms are not poisonous, but are not edible, unless the specimens are very young and tender.